Rwandan sweet potato fries, known as chips there, are not soggy at all, and like real french fries (from belgium) you fry them twice. It requires a few steps to get them right, and they are totally worth the effort. Sweet potatoes are a resistant starch and are healthier than a normal potato. That being said, they are fried. One nice thing about this recipe is that you can crisp them up in the oven after they are fried so you can make them ahead of time. Always a plus especially when cooking for a crowd. 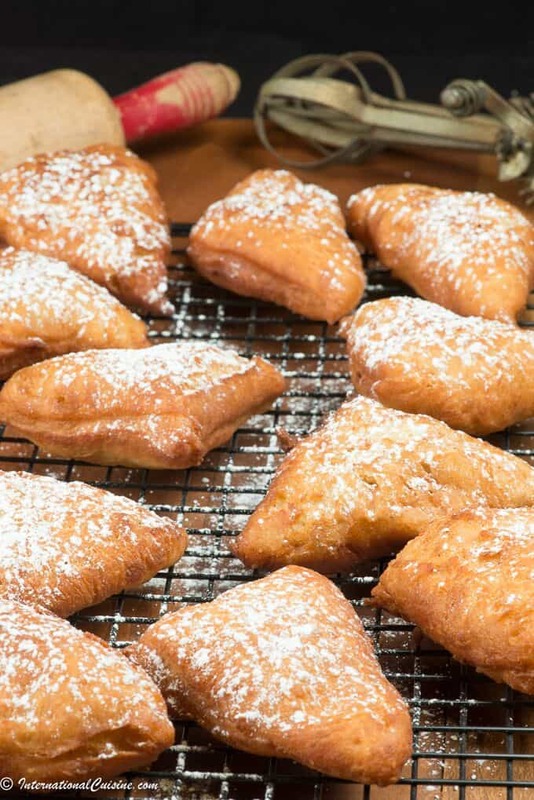 The trick to making these crispy is the not only frying them twice but soaking them first in water and then coating them with a cornstarch slurry. Yes it truly is the cornstarch that is the secret ingredient to keeping them crispy. The soaking makes them nice and tender almost pillowy on the inside. They are delicious dipped in the spicy tomato sauce that our Rwandan goat brochettes were marinated in. 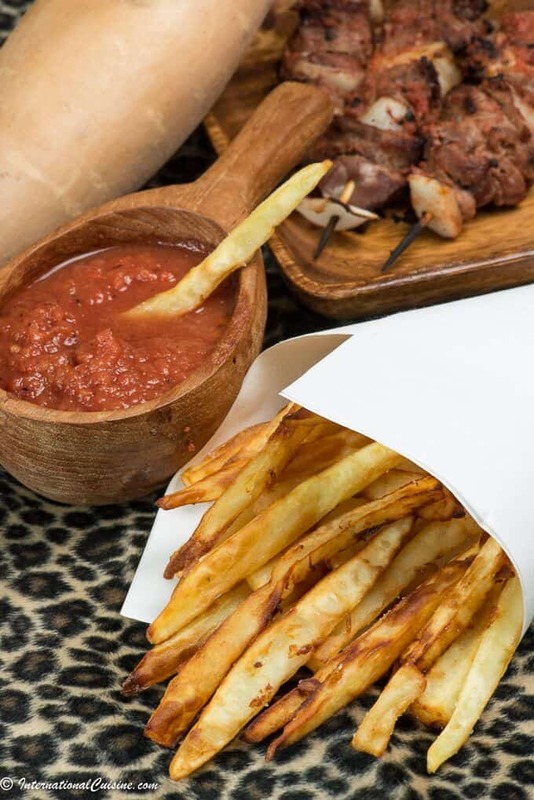 Trust me you will love these Rwandan sweet potato fries. 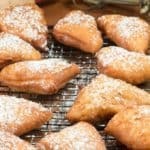 I love to use my deep fryer when making these, I put a link to the one I use and love. Did you know that Rwanda is considered one of the safest countries in all of Africa. Why not plan a trip to see the elusive Mountain gorillas? One of only three places in the world where you can see them in the wild. Have you ever gone to see them, if so please tell me about your experience in the comments below. If you would like to learn more about this small African country be sure to visit “Our Journey to Rwanda” plus get some more authentic Rwandan recipes you are sure to love. These are crispy on the outside and pillowy soft on the inside. You will love them! In a large bowl, soak the potatoes for about 10 minutes in cool water. Mix the cornstarch with the soda water to make a paste in a large shallow bowl. Add sweet potatoes and use tongs to toss and coat them on all sides. Heat your oil in your fryer to 350 degrees. Add the fries 1 at a time so they don't stick together, don't overcrowd your pan. Fry for 1-2 minutes (don't let them brown) and drain on paper towel. Once all the fries are done with their first dip in the oil, start the second round of frying. Fry them the second time for an additional 1-2 minutes, until they're browned and crispy. If you are making them ahead of time simply put them in a 325 degree oven for about 5 minutes to crisp them up again. Cuban Tostones are fried plantains. They are popular in many countries and Cuba is no exception. They are delicious sprinkled with just a touch of salt and always best just out of the fryer. You could always dip them in a little left over mojo sauce. They are served as a snack, or as a side with lechon asado or a Cuban sandwich. If you do don’t have a tostonera (tostones press) you can use the bottom of a heavy glass or a food can. Pour 2-3 inches of oil into a deep-fat fryer or heavy skillet over medium-high heat. As the oil heats, cut the ends off of each plantain, and make a slice along the length of the skin. You should be able to remove the peel in one piece, unlike peeling a banana's skin one section at a time. Slice each plantain into pieces about two inches long. Add the pieces to the hot oil Fry them for about two minutes until they start to get slightly golden, then flip them over, frying for another two minutes. Remove the cooked pieces from the pan, and drain them on paper towels. They will be very hot, so let them cool for at least 1-3 minutes. 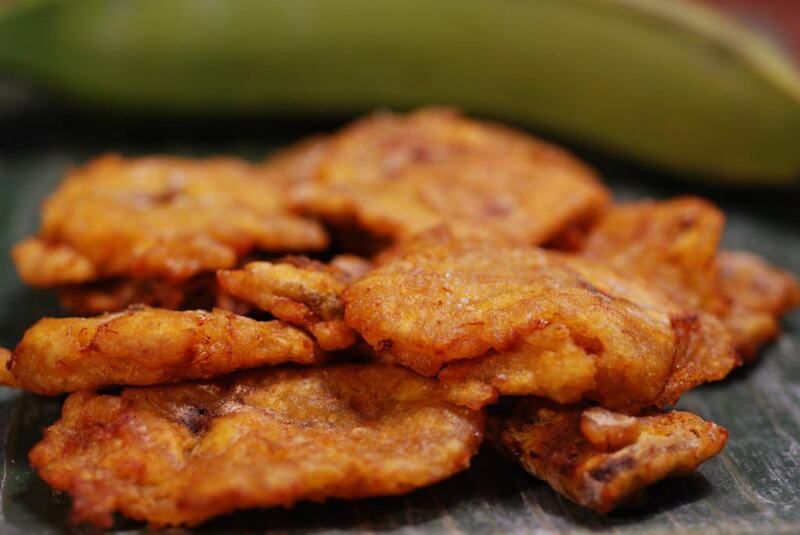 Take one of the pieces, and smash it in a tostonera (tostones press). If you don't have a tostonera, you can easily use wax paper the bottom of a glass or a food can. Place the plantain piece upright on wax paper, fold the wax paper over the top of it, and then smash it until it is ¼ inch thick. Once the cooking oil is hot again, add all of the plantain slices and fry them on both sides until golden brown (about 1-3 minutes). Remove the tostones from the oil, and drain them on paper towels. This Cuba salad is a typical green salad that you would find on many Cuban tables as a companion to the meal. It is light and refreshing, sometimes we forget how good simple things can be. Add whatever is in season and fresh. The dressing is perfect with the lechon asado it is garlicky and tangy. 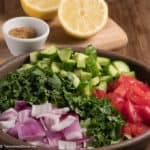 Toss together the salad ingredients in a bowl and place in a refrigerator to chill. Use a mortar and pestle to mash the garlic with the salt and pepper. In a small bowl, add the olive oil, vinegar and lemon juice to the crushed garlic. Whisk together thoroughly. You can also use a blender to emulsify the oil and liquids. Just before serving: Gradually add the dressing, a little at a time, while you toss the salad with a couple of large salad forks. Add just enough dressing to cover the salad -- more or less to your own taste. 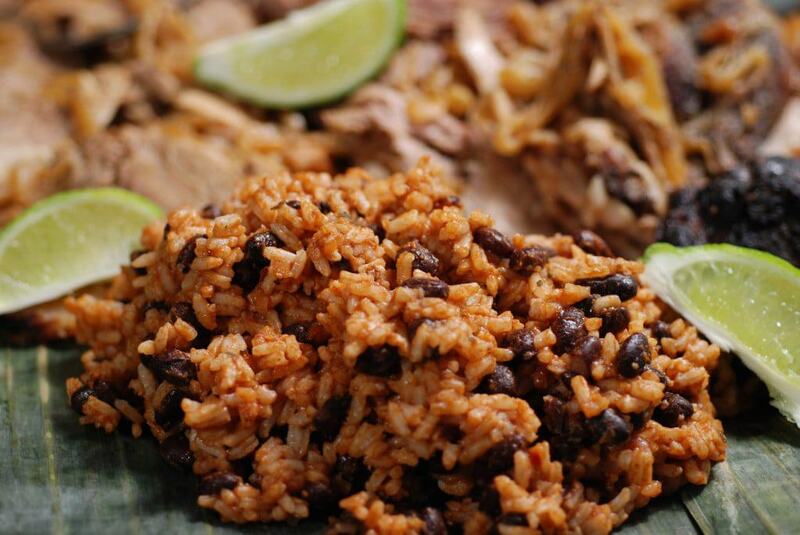 Cuban rice and black beans goes by the name Moros and Cristianos literally translated means Moors and Christians. It is assumed that the dish gets its name back in the time when Moors occupied the Iberian peninsula. In Cuba, the name of the dish refers to the mix of Africans and Spanish cultures. Whatever you call it, make it… as it is one of the best rice and beans I have had the pleasure to enjoy. Please note that this recipe calls for 1/3 cup of sofrito which is a base for many soups and stews. The homemade sofrito recipe is available under sauces. In a pot, add olive oil and sautee garlic and sofrito for a minute. Add salt, pepper, cumin and oregano to sofrito and mix. Add beans and mix well. Add tomato sauce and beer or broth and mix. After 5 minutes, add apple cider vinegar and stir. Add 2-3 cups of already cooked white rice (at room temperature) and mix well. Cook until all is absorbed (about 10-15 minutes). 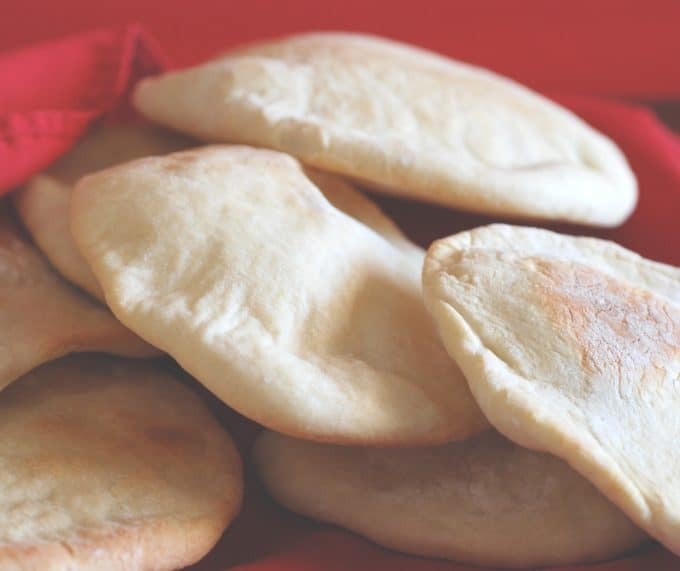 Qatari Khubz arabi is Arabian bread that is popular all over the Middle East and Gulf region. I can just imagine the smell of this pillowy bread wafting through the air in the souks of Qatar. It is surprisingly easy to make and is absolutely scrumptious with the main dish called harees. It is so exciting to see it puff up in the oven. You can use this bread for just about anything. You will simply fall in love with it. This bread is also used as a utensil in Qatar you break off a piece and use it to scoop up whatever it is your are eating whether it be baba ganoush or machboos. We used it to scoop up the creamy and delicious main dish we made for Qatar called harees. Seriously the possibilities are simply endless. Also because the khubz arabi make a nice pocket similar to a pita, you could use it to also make sandwiches. 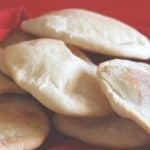 Qatari Khubz Arabi is really not hard to make, you just need to plan for some time for the dough to rise and rest about 1 and 3/4 hours before baking. Have you ever eaten with your hands? It is customary in many countries and is fun to sit on the floor on some cushions and experience it. You would only use your right hand and it would also be customary to have a hand washing ceremony before and after the meal. Did you know that Qatar is going to host the FIFA 2022 games? They are building like crazy to get ready for the big event. Why not plan a trip to Qatar to see the games. If you can’t make it to the games, why not have a Qatari party and make the whole meal? Soccer is the worlds most popular sport. If you would like to learn more about this little country of Qatar, be sure to check out “Our Journey to Qatar“. There you can learn more about the culture and traditions as well as authentic recipes for their delicious cuisine. Khubz Arabi is a scrumptious pillowy soft bread that puffs up to make a pocket when you bake it. In a large bowl, pour in the warm water and add in the yeast, stir until the yeast is dissolved. Start gradually adding in the flour and oil while kneading, you want to knead until the dough is smooth and elastic. Put the dough into a large greased bowl and turn dough to grease all sides. Cover with a dry tea towel and let rise in a warm place until doubled in size about 1 ½ hours. Place on a floured work surface and dust tops lightly with flour. Cover with a dry tea towel and let rest for 15 minutes. Bake for 10-12 minutes or until the bread puffs. Do not leave unattended while baking. 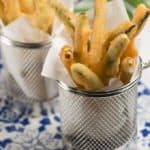 Fried green beans, battered and deep fried are called peixinhos da horta in Portuguese. Literally translated this means little fish from the garden. They appear like the slender sardines and other small fish they also love to fry in Portugal. It was this type of battering of fried green beans that was introduced to the Japanese. They called it tempura and perfected it. You can use this recipe on just about any vegetable or fish. Fried green beans are light and to be honest just about everything tastes good deep fried. 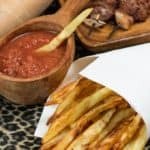 I really like to use a deep fryer for this recipe as it helps to keep the oil at a consistent temperature and it just seems like they cook faster and are less oily. This is the deep fryer I use and I love it, you can check it out here. Did you know that the Portuguese also introduced Catholicism to Japan way back in the 16th century? The word tempura is derived from the Latin word “tempora” which refers to “The Ember days” when Catholics refrain from eating meat. Portugal is an intriguing country whose cuisine touched shores all around the world. They introduced chilies to the Asians, tea to the British, vindaloo to India and yes, tempura to the Japanese. If you love this Portuguese fried green bean recipe be sure to check the other authentic recipes we enjoyed as part of our International Cuisine meal. You can get the recipes plus learn more about this fascinating country by checking out “Our Journey to Portugal”. 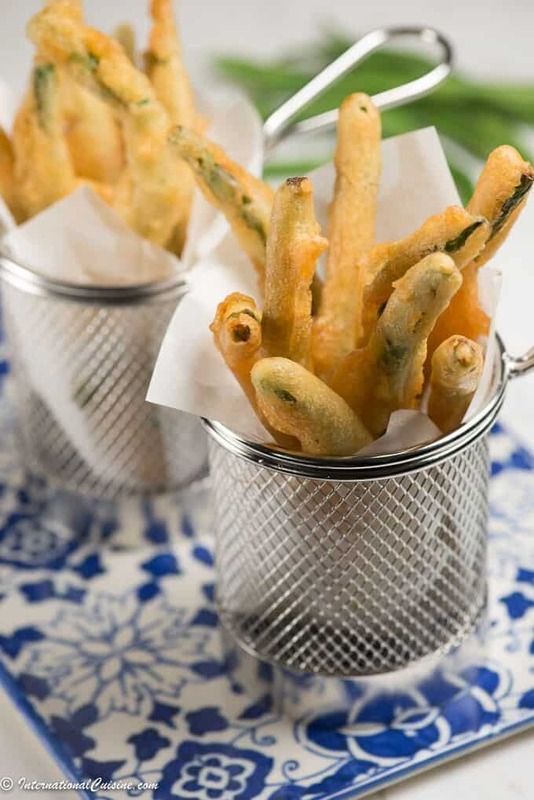 These fried green beans are simply delicious and was what the Portuguese introduced to the Japanese back in the 16th century and what they call tempura. 1) Bring a saucepan with a cup of water and a teaspoon of salt to a boil. Add the beans to the pot of boiling water and cook until almost tender but still slightly crisp, about 2 minutes. 2) Remove the beans once done and transfer them to a bowl with cold water for about a minute. Once done, place them on paper towels to dry. 3) Now heat the oil in a deep fryer or a large saucepan to 350 degrees Fahrenheit. 4) Combine the flour, cup of water, eggs, baking powder, salt in a bowl and whisk until the batter reaches a smooth and even consistency. 5) One by one, dip the green beans in this batter and then immediately fry them in the fryer until golden brown. Once each one is done using tongs place them on paper towels to remove any excess oil. 6) Sprinkle the deep-fried green beans with salt and pepper to taste and serve once done. 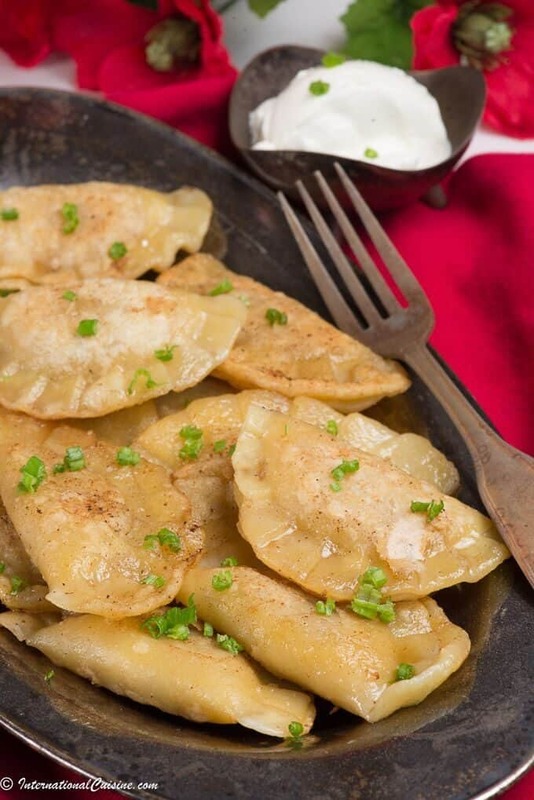 Polish pierogi are considered to be the national dish. One is called pierog and pronounced pye-ROOG, pierogi is the plural word for these little treasures. They can be filled with all sorts of things that can be either sweet or savory. An un-leavened dough is made, filled, and then dropped into boiling water. 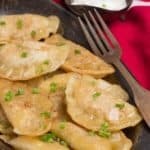 Often times pierogi are then fried in butter after being boiled. They are also usually served with sour cream. What you stuff your Polish pierogi with, is totally up to you, but some of the most treasured fillings are mushrooms with sauerkraut, fried onions, mashed potatoes and cheese, minced meat, cabbage, spinach and quark (farmers cheese). I made these bundles of joy with mushroom, onion and sauerkraut. They were surprisingly easy to make with this handy little dumpling tool, which you can pick up here. Having the right tools for the job is so helpful, but you certainly can make them by just putting the filling in the middle of the circle, and crimping the edges with a fork. You just want to make sure the edges are tightly sealed before you put them in the water to boil. Pierogi freeze beautifully as well so feel free to make a large batch by doubling the recipe. Once you make the half circle just freeze individually on a tray and then put in a freezer bag all together. Simply use however many you want when needed by just boiling for an extra minute or two longer than cooking them fresh. Polish Pierogi are considered to be the national dish. Little bundles of joy you are sure to love. Easy to make and a heavenly bite. Stir the flour and salt in a large bowl. Cut in the butter until mixture looks crumbly. Add in the eggs then milk and stir with a wooden spoon until mixture holds together. Lightly knead in the bowl to smooth. Set aside. Put the mushroom in a dry skillet over high heat, cover with a lid. Once the mushrooms release the moisture, take off the lid and cook until the water evaporates. Cut out circles using a cup 3" in diameter. Freeze or boil in water for 3 minutes. 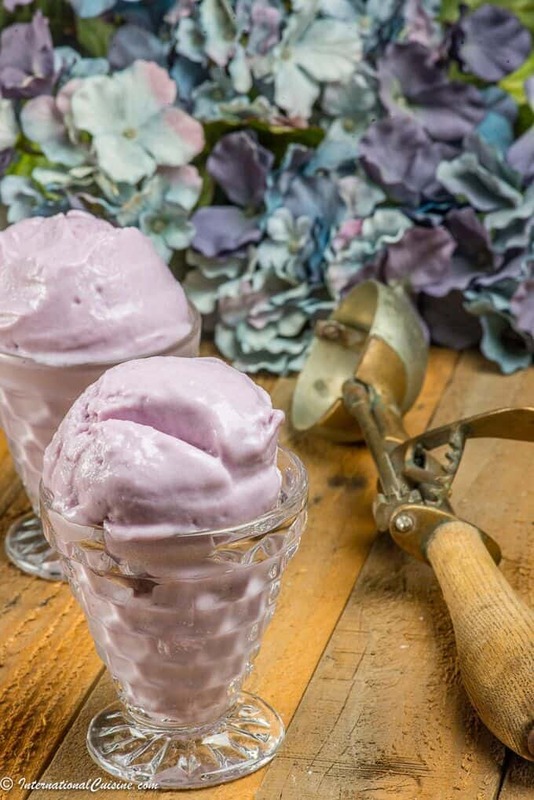 Ube Ice Cream is a staple in the Philippines. Ube pronounced OO-bae, is a purple yam. This is an ingredient that is showing up in all sorts of recipes these days. The flavor is a bit nutty and is a lovely color of purple that goes from very deep to lavender. The size and where the yam is grown completely affects the flavor. The larger ones are much sweeter than the smaller ones and they come in an array of colors of purple to nearly white. Ube made into an ice cream can be done with or without a machine. I used my ice cream maker that is part of my kitchen aid and it works beautifully. Ube is a resistant starch that is loaded with nutrition. It has almost 40 grams of carbs in one cup 5 grams are dietary fiber, it contains no fat and about 2 grams of protein. It is also packed with Vitamins A and C as well as potassium. The purple pigment provides special antioxidants including anthocyanins. which have been linked to anti-inflammatory effects, brain health and protection against heart disease and cancer. It can be mashed or pureed or baked like a regular sweet potato but it is often used to make sweet treats like ice cream, puddings, frostings, even doughnuts and pop tarts. It is also made into a jam called halaya. The ube ice cream is also used in the famous halo-halo dessert. 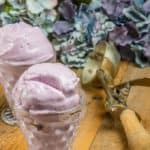 This recipe is completely plant paradox friendly so I hope you enjoy this beautiful and satisfying creamy ube ice cream. Did you know that the Philippines is known to have the world’s best sweet mangoes? Be sure to check out “Our Journey to the Philippines” if you would like to learn more about this beautiful archipelago with the some of the friendliest people on the planet. A beautiful and delicious ice cream made from purple yams called ube. It is vegan, paleo and plant paradox compliant. You are sure to love this one! It can be made with or without an ice cream maker. Pour into a container and chill overnight. Once the mixture is chilled, you simply add it to your ice cream maker, following the manufacturer's instructions. Once churned, add to a shallow, freezer-safe container and freeze for at least 6 hours. If you have a stand mixer with a metal bowl, you can freeze the bowl overnight and "churn" the ice cream using the paddle attachment. Otherwise, you will need to whisk the mixture well before freezing it and repeat every hour or so it does not become icy. Arrowroot powder can be found in the baking aisle of the supermarket. You can also use tapioca starch. The alcohol is to help keep the ice cream from freezing too hard. Kachumber salad is a very common, chopped style, salad, loved in Pakistan. In fact, kachumber literally means, cut into small pieces. It is pronounced, ku-chum-ber. However, it is no ordinary salad. A spicy, hot and tart spice blend called, chaat masala, makes this one extra special. The spice blend can vary, based on your favorite flavors. The tartness usually comes from amchoor (mango powder) and/or tamarind powder. The spiciness comes from chili powder. It also includes other aromatic flavors like: cumin, coriander and ginger. Black salt (which is a rock salt) is another important ingredient in chaat masala. You probably won’t find this salt in your local grocery store, but you can find it here, or perhaps at an Asian or Indian market (sometimes it is spelled chat masala). You can always try your hand at making your own signature spice blend as well. It is delicious on fruit and eggs too! In Pakistan, salads are served along with the main meal and not as a separate course. 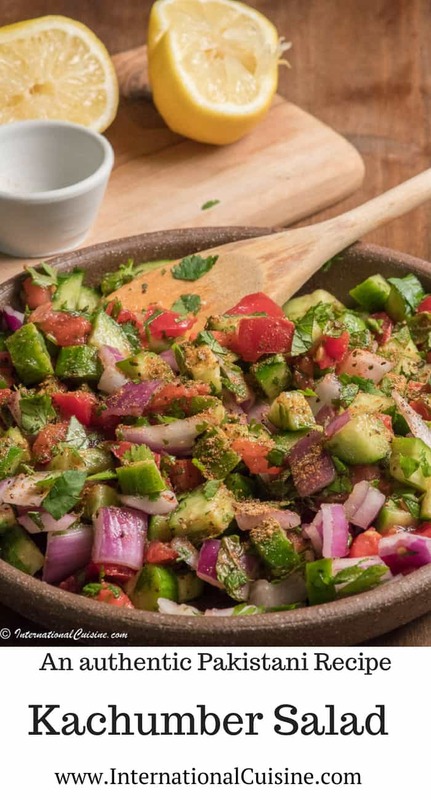 Kachumber salad is usually made with tomatoes, cucumber and onion and any variety of fresh herbs. You can use any vegetables you have on hand. I have had kachumber salad made with carrots, radishes and cabbage. You just want to chop up the vegetables in small equal sizes, for a proper kachumber salad. The other nice thing about this salad is, it is only dressed with lemon juice, so it is super healthy. We served our kachumber salad along with the main dish called, chicken karahi and fresh naan bread. 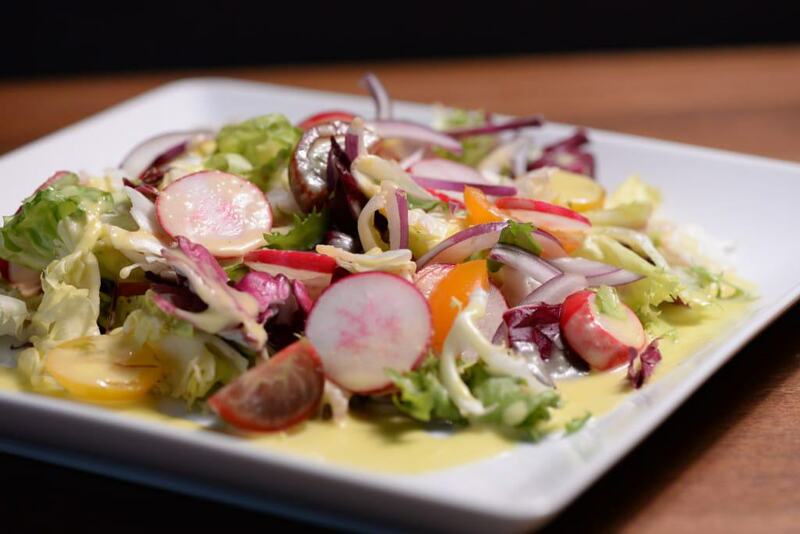 The naan bread makes the perfect implement to scoop up the fresh and crisp kachumber salad. To enjoy a kachumber salad, as you would in Pakistan, make certain to only use your right hand to eat your food. Utensils are not typically used. (The left hand is considered to be unclean.) If you are invited into a Pakistani’s home, remove your shoes before entering the home. You will likely sit on a dastarkhan (cloth or rug covering) on the floor. Make certain not to point your feet toward anyone, as that is considered rude. For even more countries and recipes from around the world, join the culinary and cultural journey. It’s free just sign up below. You can also follow me on Instagram, Facebook , Pinterest and youtube to follow along our journey. Please note, that this post contains affiliate links, in which I may earn a small commission, but this does not in any way affect what you pay. I thank you for your support. You can also find more authentic Pakistani dishes and recipes for the other countries of the world under the “Journey by Country” page at Internationalcuisine.com and join the journey for regular updates. An authentic Pakistani salad recipe called Kachumber salad. 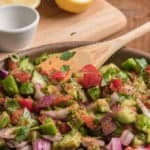 It uses a spice called chaat masala that takes this salad from ordinary to extraordinary, A chopped style recipe you will love. 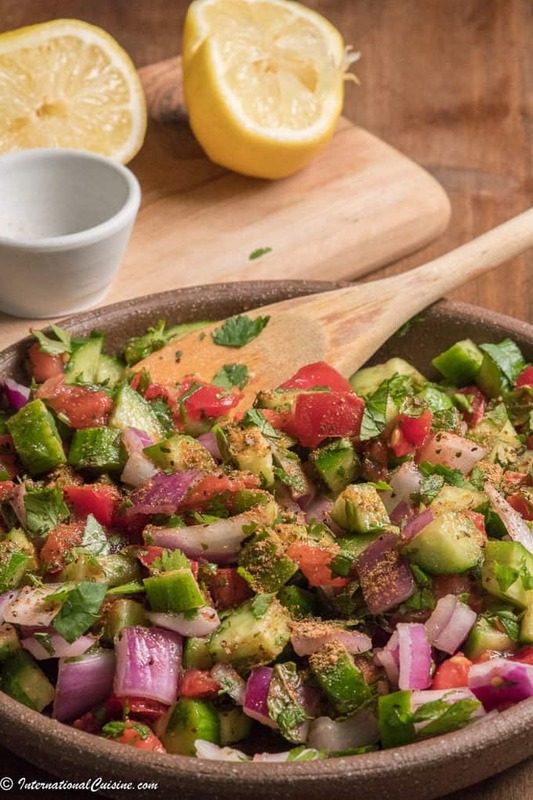 Put all the vegetables in a bowl along with the fresh herbs and toss gently all together. Sprinkle over the chaat masala and mix well.